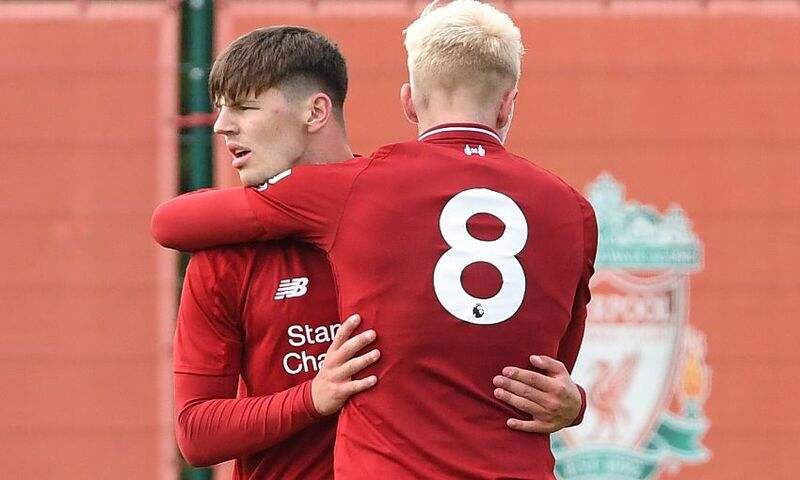 Bobby Duncan scored twice as Liverpool U18s came from 2-1 down to beat Stoke City 4-2 in the Premier League Cup on Saturday. Barry Lewtas' side showed great spirit and character as they fought hard in a physical away encounter. The young Reds started brightly and Duncan fired a third-minute opener after a team move involving Elijah Dixon-Bonner and Fidel O'Rourke. The hosts came back to take a 2-1 half-time lead but Liverpool levelled when a Luis Longstaff cross was headed into his own net by a Stoke defender. Jack Bearne came off the bench to put the visitors in front and Duncan netted again to seal a good day's work for the U18s. Reflecting on the victory, Lewtas told Liverpoolfc.com: "Stoke away is always a tough fixture and we had to dig deep to get the victory today. "We were a bit disjointed in the opening half but we changed our shape and got at them down the sides in the second half. "Bobby scored two good goals and it was nice to see Jack on the scoresheet again. "The boys showed a lot of character and we competed much better in the second half." Liverpool U18s: B. Williams, Walls (Savage), Larouci (Tagseth), R. Williams, Clayton, Ritaccio, Dixon-Bonner, Clarkson, O'Rourke (Bearne), Duncan, Longstaff.